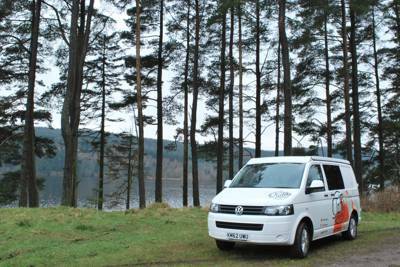 book a camping trip on coolcamping.co.uk and you could win a weekend of vw campervan fun! We've teamed up with South Wales & London-based Taffi Campers to offer one lucky Cool Camping fan the chance to win a weekend's hire of their immaculate, super luxury VW T5 Transporter campervan. This hydraulic pop-top roof is up in seconds to reveal an ingeniously concealed easy pull down bed. Comfy, spacious and sturdy, this aluminium framed slatted bed sleeps up to two, with an additional couple of passengers taken care of on the fold out beds. A fully crash-tested injection moulded seat that niftily folds into a memory foam bed, sleeping two. The front seats swivel effortlessly to create yet more room and a communal space for enjoying meals together in the kitchenette/dining area. With the choice of a London or Cardiff pick-up location, Wil is the perfect companion for for your roadtrip. A Welsh adventure awaits with the stunning Brecon Beacons, The Gower, Pembrokeshire Coast, Snodonia and Anglesey all easily reachable from Taffi Camper's main base just off the A470. to be in with a chance of winning simply book your camping or glamping holiday on the cool camping website and you’ll automatically be entered into this incredible prize draw! The competition closes at midnight on 31st December, 2016, after which we’ll pick the the winner at random. Good luck – and please read the Terms & Conditions here before entering.